Rice and Curry book takes you through Sri-lanka history, culture and it's cusine . The book is written by is Skiz Fernando who is a second generation Sri Lankan-American and graduate of Harvard University and the Columbia University School of Journalism. He has written for the New York Times, Rolling Stone, Vibe, and Spin. He has produced several albums on his WordSound label, and is also writer/director of several films. 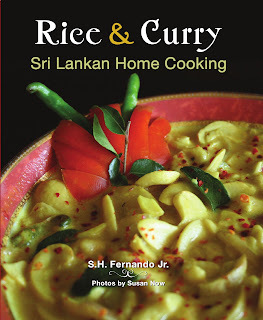 In 2006, he moved to Sri Lanka for a year to learn about its cuisine and research this cookbook. In March 2009, he was featured on Travel Channel's No Reservations with Anthony Bourdain, where he led the crew to Sri Lanka's hot spots. In Asian countries atleast in Sri-lanka and in India "Rice and Curry" is the main dish. These curries can be made with either vegetables, fish, meat or chicken. The book starts with the author's introduction with stories about Sri Lankan history, travel tips, spice tips and information on merits of ingredients/ spices and Ayurveda and family recipes that had been tried, tested and passed down to him by the family. The recipes in the book are accompanied by some lovely photographs of the end results and it is hard to choose which one to try first as they all look so yummy. He has also included Sample Menu which helps in choosing the right dish to make based on the no. of people who will eat. He has shown sample menu's for 4-6, 6-8 and for 8-10 people. This is one of the great cook-books I have come across which explains everything from spices to dishes, culture to travel in detail. I highly reccomend this book to all the food lovers who would love to try some great and tasty recipes. I am not a certified nutritionist.All recipes are tried by me at home. Popcorners Review and Giveaway Winner!! Highlight the text in the box and press CTRL C to copy our button code and then press CTRL V to paste it to your site.